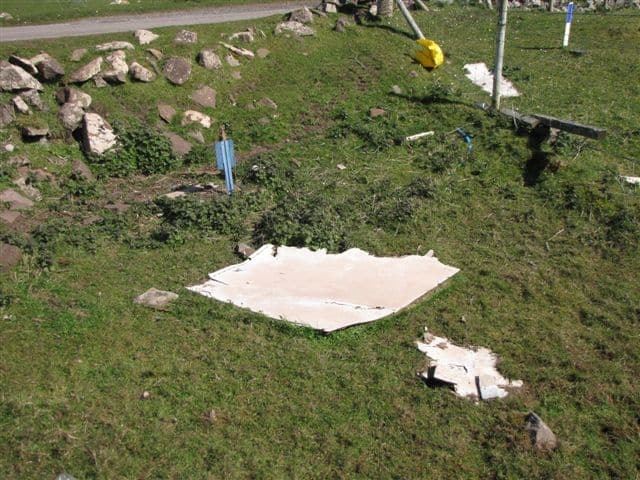 On 6th May, I was parked at the bottom of a track up to a house at Clachtoll (NC041277), when I noticed a large piece of thin plastic-coated plywood, dumped in a damp hollow just off the road (Photo 1). Lifting it up, as one does, the first creatures I saw were two very dark adult frogs, which rapidly made off into the surrounding grassland. 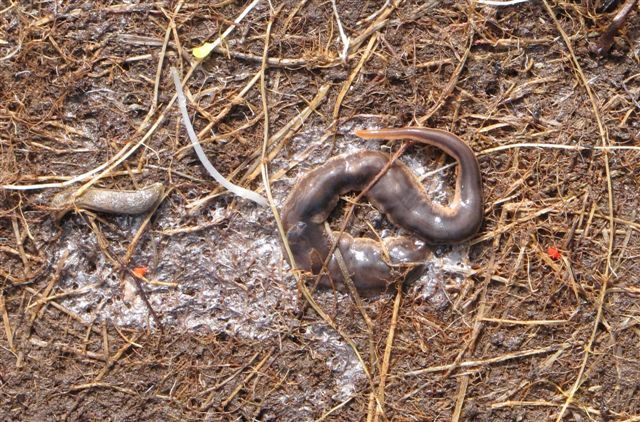 Then my attention was caught by a less attractive sight, two large coiled flatworms (Photo 2). From their colour, brown with paler edges, I was able to recognise them as examples of the notorious New Zealand Flatworm Arthurdendylus triangulatus. After a few minutes exposure to the light, while I fetched a camera, one unwound, extended to a length of 125 mm or more, and began to slither away (Photo 3). Other invertebrates sheltering under this sheet included a garden snail Cornu aspersum, a copse snail Arianta arbustorum and a variety of small slugs, of which one at least was identifiable from a photograph as the very common species of fertile ground Deroceras reticulatum; there were also millipedes and woodlice. What I had not noticed, until it was pointed out by my passenger, was a lovely brownish-red adult toad, hunkered down in a grassy depression. New Zealand Flatworms are native to the South Island, and are thought to have been introduced to the British Isles with potted plants during the 1960s. The first record from Scotland was in Edinburgh in 1965. They are common in garden centres and have spread throughout the mainland and on to some of the islands. 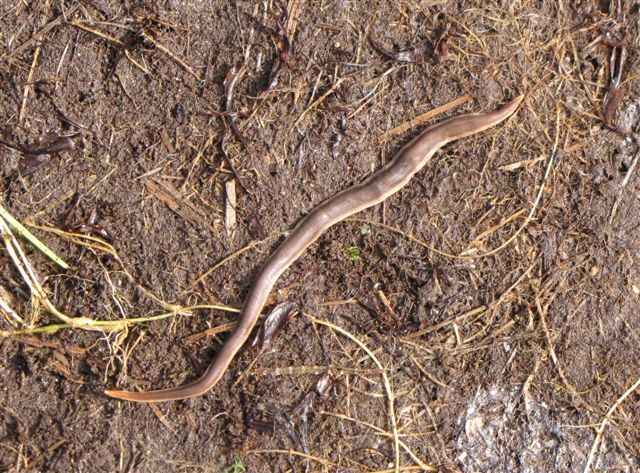 Since they predate our native earthworms, particularly surface-dwelling species with relatively large burrows, the species is regarded as a potentially serious pest and was placed on Schedule 9 of the Wildlife and Countryside Act in 1992, which makes it an offence to release them or allow them to escape into the wild. The first local record of this species of which I am aware is of ones found by George Morrison under a discarded piece of clothing at the edge of the playing field in Lochinver (NC093220) on 27th May 2003. The HBRG database, kindly accessed by Murdo Macdonald, has only one other Assynt record, from the grounds of Glencanisp Lodge (NC1122), where they were noted by Don O’Driscoll in August 2015. There are, however, over forty records from elsewhere in the Highlands. I seem to remember being told that their black egg capsules, which look a bit like blackcurrants, had turned up locally in soil surrounding potted plants purchased elsewhere. Please let me know if you come across either egg capsules or adults.